Visit our artisan studio gallery in Prince Edward Island! 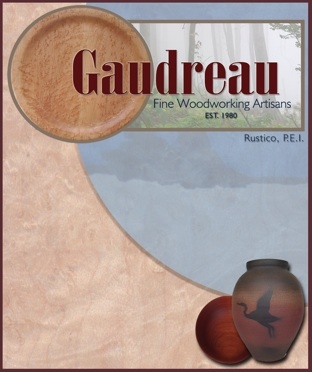 Gaudreau Fine Woodworking Artisans are the makers of unique designer woodenware. The studio's award winning artisans, Diane and Jacques Gaudreau, pay special attention to the fine details and finishing of a complete line of hardwood household and office accessories. Black walnut, bird's eye maple, red oak and cherry of the finest quality are carefully selected to blend and contrast with contemporary or traditional environments. 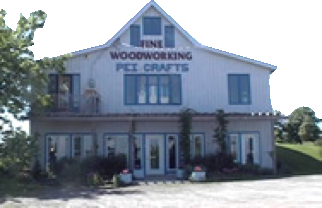 Located halfway between Cavendish and Charlottetown and offering designer hardwood accessories handcrafted on the premises. The 2000 sq. foot showroom features 20 maritime potter's work. Observation windows allow you to view craftsmen making mirrors, bowls, trays, boxes, etc. Hope you will be able to visit our Fine Crafts Gallery this summer! Our collection features the works of talented Maritime artisans.